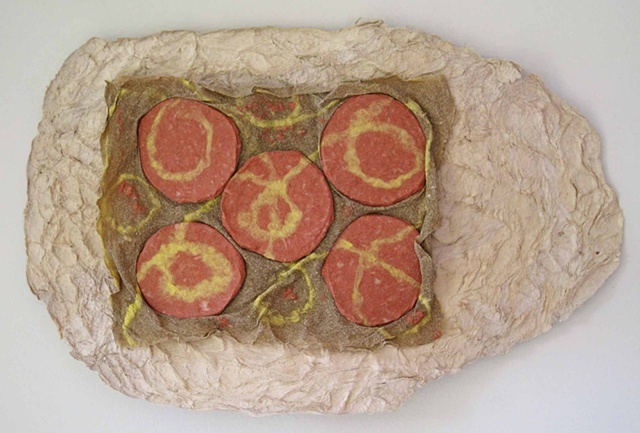 Flax paper constitute the rectangular pizza of this handmade paper art including the pepperoni, sprinkled with cheese made of yellow-pigmented cotton fibers. The flax-cotton paper pizza sits on a piece of bark paper (%amate&) that was made by beating strands of cooked kozo (paper mulberry) bark with a stone into the desired shape. The roughness of the amate surface reflects the beating process used in its creation. The completed assemblage was mounted on a wooden backing for hanging the piece.